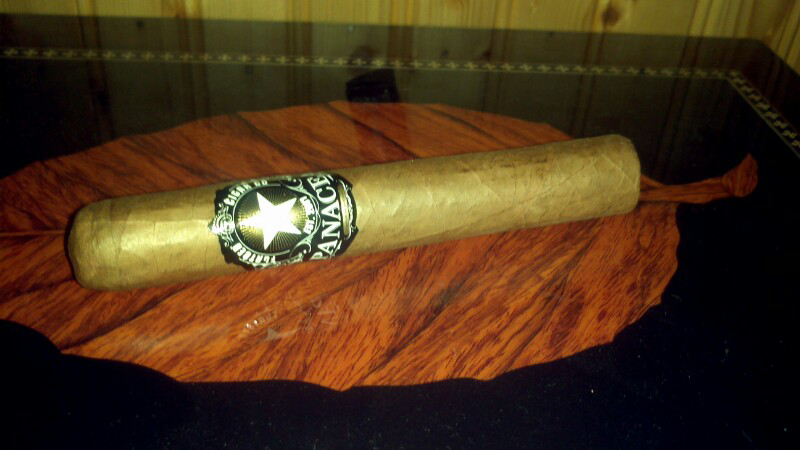 This is the third Panacea cigar from Flatbed Cigar Company which I have tried and the first one I did not like. Sometimes you smoke a cigar, and you have to conclude "this is probably a very fine cigar; it's just not for me." Their black label comes wrapped in Connecticut leaf, which has a hay barn odor and a bitter salt taste. This was a robusto. The wrapper is tight and impeccable. Construction is very firm. You would think from squeezing it that it would draw too tight. It uncapped easily. Drew pretty easy unlit, giving me hay. It took me two matches to fire this one up. I got plenty of smoke. A creamy hay flavor from the wrapper. Now here's where the trouble started. Years ago, I used to smoke a Latakia pipe tobacco. Latakia is Turkish tobacco hung in a closed smoke shed and cured over a fire made of camel dung. Sounds gruesome, and I'm sure they'd claim the fire was all wood, so as not to put off the squeamish; but if you have ever smelled buring cow chips, this is it. Latakia actually makes a tasty pipe tobacco. Your leaf is smoked before you smoke it. Well, this mild and milky Connecticut tasted like it has a thread of Latakia inside. Not saying they used that, because I can't see where Latakia would burn worth a crap in a cigar, being such a tarry substance; but the same effect whatever they used. And the farther I went, the thicker the thread became. I'm sure it's a very imaginative idea, and makes for an unusual Connie; but that's not what I am looking for when I grab a creamy mild smoke. Buttermilk is good; but you don't want to reach into the fridge for milk with your Oreo and discover the hard way you have buttermilk. It grated my nerves. Plenty of smoke. An absolutely perfect burn. But an hour and a half of getting on my nerves. Mild retro. Prickly throat. Bearswatter hung a cloth napkin over her face because of the smell. I got no stinkfinger to speak of. Morning mouth was acid and came with a burn in ,y gullet. I got a wet wheeze, too. I'd have to rate this no higher than three stars.